How about this trick? For camping or late nights at the beach? 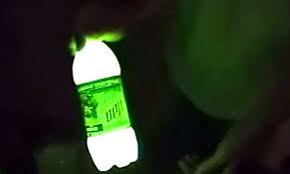 Leave 1/4 of Mountain dew in bottle (just don’t drink it all), add a tiny bit of baking soda, a few drops of dish washing liquid and 3 caps of peroxide. Put the lid on and shake – BADDA BING! There is another recipe for this concoction on the Internet that does not include the dish washing liquid. It will not glow! As usual I want to try to get it right the first time so you’ll find a video below that shows you exactly which recipe to use and how to concoct it. Because I haven’t actually tried this I’m not sure how long the glow will last or if you need to keep shaking it to keep it glowing. But if nothing else it would make a pretty cool kids project (with supervision of course). Maybe even a science project. Categories: PLASTIC BOTTLES | Tags: craft, glow stick, Mountain Dew, plastic bottle, re-purpose, soda bottle | Permalink.